Beautifully tumbled and polished Snowflake Obsidian healing gemstone with a high sheen. Great for wrapping or carrying in pouch. Snowflake Obsidian helps to dissolve pain, tension, and energy blocks. Sizes vary with most being 3/4 to 1 inch size. Opens awareness of past lives and of having many incarnations, increases our knowledge that we have been here before and will be here again and that there is no death of the soul. Aids in past-life meditation and regression work. Aids in understanding the present in terms of the past and heals karma and karmic patterns. All Obsidian varieties have an amorphous crystal system and are in the mineral class of oxide. Snowflake Obsidian is a black, opaque stone with gray to white distinct markings. The beautiful patterns of snowflakes that stand out of its black background are inclusions of gray feldspar and it is found in Utah. Obsidian is formed volcanically when lava that is rich in silicic acid has been cooled extremely rapidly. The lava hardened so quickly that no crystalline structures were able to form. The result was an amorphous, solidified, molten mass that contained large amounts of minerals, water and gas inclusions. When the Obsidian began to finally crystalize the feldspar became more apparent. Left untouched, this process would continue until it is completely transformed into all feldspar. 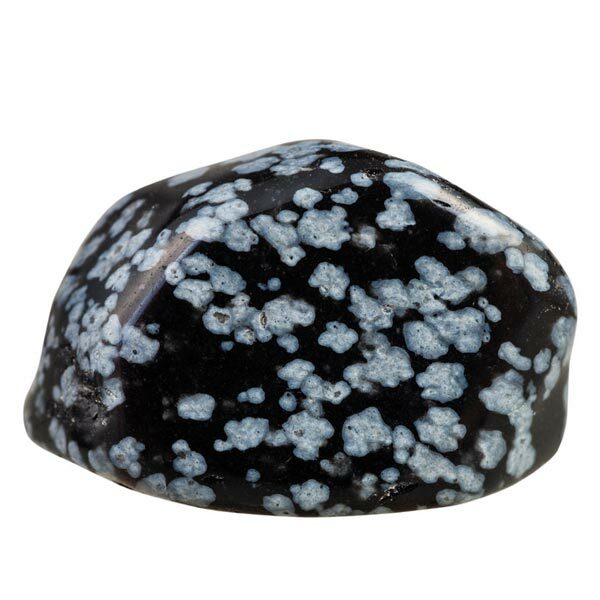 Snowflake Obsidian can be used to effect the emotional soul by using a sphere and quietly meditating and contemplating upon it. It is recommended to end the meditation with a final clearing using a quartz crystal. To improve circulation, it is best when worn next to the skin. Snowflake Obsidian helps us to attain integrity as it aids us in seeing our shadow sides in their true nature so they can become a part of our self again. It is how to reach the level of the unimpeachable warrior and gain spiritual invulnerability and freedom. In doing this, forgotten capabilities may be retrieved and our perceptions can become refined to the point of clairvoyance. Snowflake Obsidian expands our consciousness and helps to change restricting beliefs, communication and behavior patterns. It will assist in sharpening the senses and help your intellect penetrate mysterious experiences and accounts. 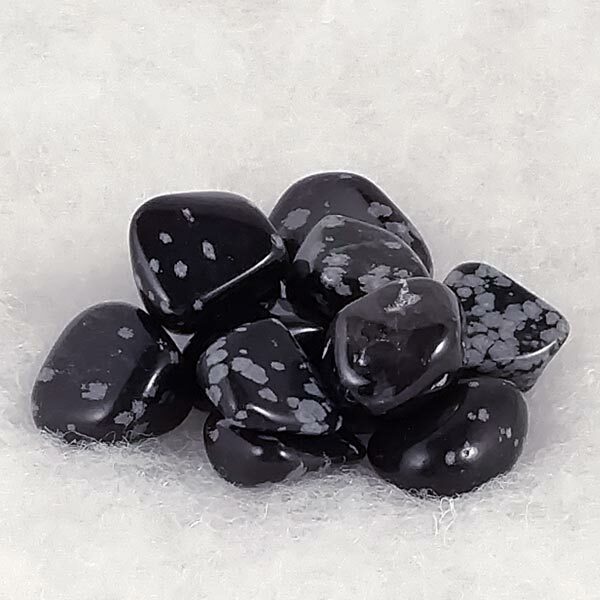 Snowflake Obsidian helps to dissolve pain, tension, energy blocks and vascular contractions. Shock resulting from injury is dissolved on a cellular level so it helps accelerate the healing of wounds. In improving circulation it ensures the warming of your extremities like chronically cold hands and feet. Snowflake Obsidian relates well with Scorpios, but benefits all signs. It has a Projective Energy, its Planet is Saturn and its Element is Fire. Obsidian blades have been found in burial sites dating back to Palaeolithic times. It had been regarded as a stone that would drive out demons. In the Middle Ages it was used as an aid for magical rituals. Mayan priests used obsidian mirrors for predicting the future. Today it is the favorite material for scrying mirrors of the modern witch.